Do you remember this one? It was standard picnic fare when I was a child. Every once in a while when I'm asked to bring a salad to feed a crowd, I turn to this old standby. With Mother's old recipe, you can take short cuts and use some canned veggies. And to keep things fresh, you can make nearly the entire thing with lovely crisp vegetables. I personally use canned kidney and garbanzo beans, but use fresh yellow and green beans, quickly steamed. I use frozen limas, but steam briefly and cool them. Sometimes I add a carrot, or radishes...odds and ends of whatever's left in the vegetable bin. You can also add other kinds of beans like black or cannellini beans, but I am posting Mother's original recipe, cans and all; tweak it any way you like. It all depends on how much of a hurry you're in. Note: This has to be made a day ahead. Easily feeds 15 or more depending on portion size. Mix the water, vinegar, sugar and salt in a saucepan and heat until sugar is dissolved. Cool. Place all canned beans in a colander to drain the liquids and then place in large bowl. Add any fresh vegetables you have made, then add celery, onions and green pepper and cauliflower. Mix. Pour the dressing over the vegetables. Push the split garlic down in the marinade. Refrigerate for at least 24 hours, stirring several times. 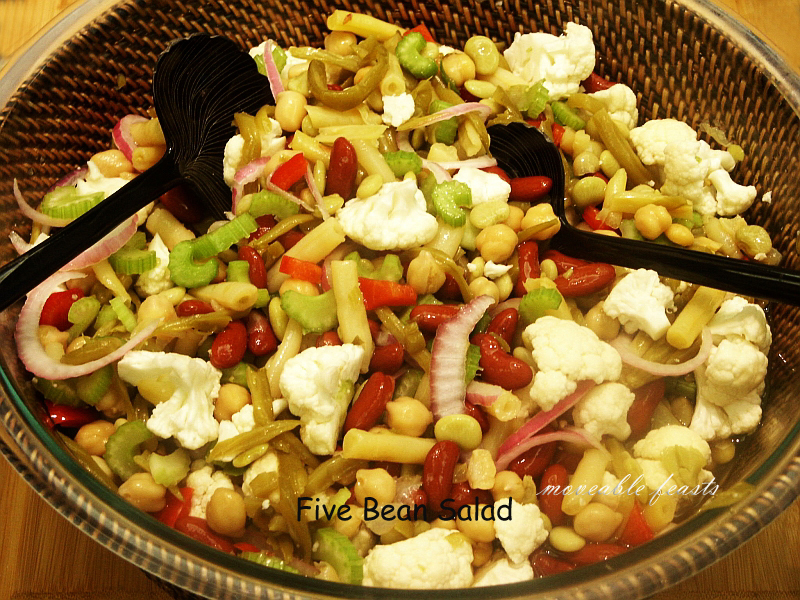 Five bean salad is the PERFECT picnic recipe! I love beans...the more the merrier. wow, that seems like a lot of vinegar! But I'm trusting you, I so want to make this! Thanks! A funny game. Unfortunately, I don't have enough time to participate. That slad looks very scrumptious! Boy Barbara you brought a smile to my face. I really remember the ole 5 bean salad. My mom & her mother use to make this a lot. Really a tried and true staple for a picnic. Thanks my friend & hope you weekend ahead has a picnic in store?!! What a fun idea! I'll have to go read all about it! I'll take a look at the contest over at Louise's too. I think I'll now have a 5-bean recipe I'll actually use. LOVE the cauliflower in there! Great salad. I am checking out the picnice game. Wonderful Salad, Barbara! Perfect for our virtual Picnic Game and a "real" picnic too:) So many goodies, I too love the addition of cauliflower and sweet red onions. Thank you so much for bringing this on the Picnic. I only wish we could really devour it!!! Sounds like a fun picnic :) I love your five bean salad! Have to give this one a try for sure! Sounds like a fun picnic...and no bugs! The salad reminds me of my mom's! It looks so festive and perfect for picnics. I was never much of a bean eater, but it looks attractive! Barbara, what a lovely combination of beans. The game sounds like great fun. I've never had that salad, but I love beans! Isn't Louise fun? I just wish it was a real picnic instead of a virtual one! I love the yellow wax beans in this salad. I don't see them that much in the market. This is a classic American salad that I have had at potlucks before; however, I had no idea how to make it and what the dressing was made of; now you have enlightened me! Lovely salad! I don't often make bean salad, but this sounds really good. I think our mother's knew one another because she loved to make 3 bean salad for picnics... a fifties thing I think. It was so good with hotdogs... I sometimes put it on top of the dog with the mustard... to my mother's horror... half of it ended up on the ground but it tasted great!!! Thanks for the memory!!! I adore bean salad...you know I will be saving this recipe for sure my friend. xoxoxoxo Have a great weekend. I love visiting you...I always go away with something yummy to look forward too. Yay, congratulations, Barbara! You 've done a wonderful job on this one. Perfect picnic recipe. I'm sure Louise going to jump with joy. haha... Hope you're having a great day! What a fun idea. I love that you are still making your mom's yummy recipe. "I'm going to ______ and I'm going to wear _______"... and then in our heads we would design dresses that we would wear to a ball and stuff :). I never heard a picnic version. Salads like these are great for a picnic. This one looks so pretty and healthy too. My favorite picnic dish to bring is tuna pasta salad. What a great summer recipe! I'm looking forward to bringing salads like these to work for lunch! I've never heard of this game before...now I'm intrigued. You know how much I love my legumes. This salad fits right into my philosophy about food preparation. I am prety sure if I made this my husband would propose again. He lOVES those ingredients... he would just adore this salad! P.S. I am not sure if he really 'adores' anything, him being a manly man and all. Maybe he would kist like it and grunt a lot. Agree-it's such a great picnic recipe and it's also healthy and good for you. What more could you ask for? I detested five bean salad when I was a kid. However not that I am of age, I won't say what age, I adore it! Something about those multitude of beans, onions and vinaigrette makes me happy. Comfort food I guess. Yours looks terrific. I love the idea of adding cauliflower. Yum, your mother made this salad just the way I like it. I always use red onion in my bean salad and add extra garbanzo beans because I like them best. WHat a great summer salad recipe! The recipe I inherited was only three beans! The more beans the merrier, IMO :) I love them all! What a fun game to play and a delicious 5 Bean salad recipe you have shared. I love bean salad and it is such a great thing to take to a picnic. It is more soups and stew weather here. I made a big pot of minestrone soup. I hope that you have a lovely weekend and great weather and maybe a picnic. I love bean salad, and I miss this kind of picnic salad! Just the other day, I had to explain to someone what a macaroni salad is. The classics are slipping away! We do letter potlucks, they are a lot of fun. Its cool to see how creative people get. What a lovely bean salad this surely is, dear Barbara!! Many kisses from sunny & hot Brussels! Once I had leftover bean salad and I threw it in the food processor and made a bean dip! It was great! You have a wonderfully delicious and healthy combi for this picnic salad...so perfectly happy summer!!! What a fantastic idea - while I won't be able to join, next time I have a picnic I'll definitely use this method to determine what people should bring. YUM! I would LOVE eating this salad! Oh Barbara you have me thinking of my grandmothers and their wonderful bean salads. Its funny, I just had such a sweet dream last night of my Grandmother and now your post has me thinking of all the picnics we use to go on in Vermont when she would bring this salad. I'm going to make this one fro sure!! we always had bean salad out of a can when I was little and it never was as impressive and your mum's - though I would prefer fresh green beans too! Oh we used to play the picnic game except we called it something else, I think it was "I'm going on a holiday, and I'm taking along....". That sounds like a perfect picnic salad, the vinegar and sugar almost make it like a fresh pickle doesn't it? wonderfully simple and gorgeous.I absolutely love bean salads, they are so full of different flavours and textures! This is still one of my favorite salads and sadly you don't see it much at potlucks. How can you have a picnic without Five Bean Salad? Thanks for this great recipe! This picnic is going to be fabulous! This looks like a great protein packed bean salad. I think everyone appreciates a recipe that is versatile with room for shortcuts when entertaining. Hi Barbara! I just wanted to pop in and thank you once again for playing the picnic game. As expected, your Five Bean Salad was a huge hit!!! It's really been fun!! !